Many athletes today focus on one particular physical activity. The result can be an overuse injury where muscles become stressed and reactive. Soft tissue injuries often involve sprains, strains and muscle stiffness. A Licensed Massage Therapist is educated on healing techniques for different types of Sports Injuries. 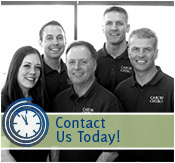 At Caron Chiropractic Clinic, P.A. in St. Paul, MN our experienced massage therapists provide Therapeutic Massage Techniques that are designed for optimal healing and injury prevention. Therapeutic Massage has become quite commonplace among high-level athletes. Many utilize Sports Massage as a way to improve performance and shorten recovery time. An experienced Licensed Massage Therapist can provide a variety of techniques to target the injured muscles and speed healing. Trigger Point Therapy alleviates tender spots that cause referred pain in other areas of the body. Your massage therapist applies pressure and release technique to tense muscle tissue to relieve pain. Deep Tissue Massage focuses on the deepest layers of muscles and tendons to release chronic tension. A massage therapist applies deep pressure that lengthens the muscle tissue and relieves pain. Swedish Massage is a relaxing, therapeutic massage that utilizes gentle strokes to relieve stress and relax muscles. This healing technique improves circulation and eases tension. Sports Massage is geared toward muscles that are overused and stiff. It is often used for athletes who want to loosen up before an event or prevent pain and stiffness after exertion. Our Licensed Massage Therapists may utilize several different massage techniques for optimal benefit. Caron Chiropractic Clinic, P.A. utilizes Therapeutic Massage as a natural healing modality. Our Licensed Massage Therapists are experienced and skilled in several massage techniques that can enhance healing of sports injuries. Massage therapy is widely accepted as a Healing Technique that also helps to shorten recovery time following an injury. This entry was posted	on Friday, February 20th, 2015 at 7:12 pm	and is filed under Chiropractor, Exercise, Healthy Living, Massage Therapy, Sports Injury. You can follow any responses to this entry through the RSS 2.0 feed. You can leave a response, or trackback from your own site.